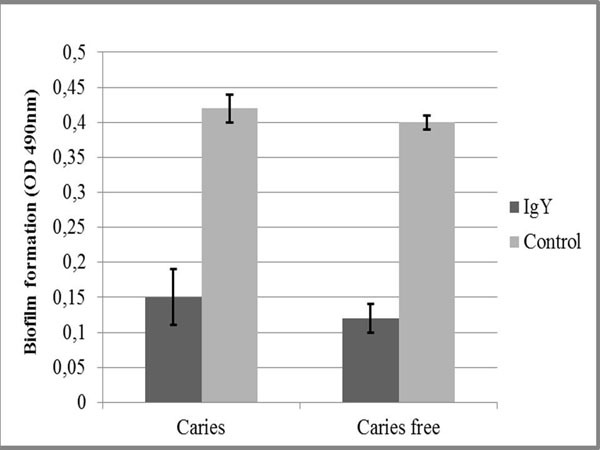 The effectiveness of active immunization for the prevention of caries has been reported for animal models, but active immunization is not applicable in humans due to side effects. A passive immunization approach may therefore represent an alternative option for the prevention of dental caries caused by bacteria. As in other bacteria, the expression of the virulence factors of dental plaque-forming bacteria involves interspecies communication mechanisms, or quorum sensing [1-4]. Interventions affecting this communication system can be used as a strategy to control the colonization of the bacteria that cause caries. In S. mutans, communication involves the role of autoinducer molecules and their receptors (ComD) at the cell surface [3, 5-8]. DNA vaccine technology is more practical than protein vaccines [9-11] and it may be used for dental caries prevention, for example to induce the formation of specific IgY that inhibits the formation of dental plaque. The inactivation of genes encoding ComD decreases the potential of S. mutans to form colonies and to interact with other bacteria commonly found on tooth surfaces, such as Actinomyces viscosus and Lactobacillus spp. [6-8]. A study by Li et al. revealed that the inactivation of ComD and ComE in S. mutans resulted in an acid-sensitive phenotype and reduced biofilm formation . Furthermore, the ComD mutant had a decreased ability to adhere to a mucin-coated polystyrene surface. Immunization of chickens with vaccines containing ComD genes in an expression vector with a eukaryotic promoter may improve the immunogenicity of vaccine [12-14] and results in the production of a specific IgY antibody against the ComD protein. Based on these findings, we aimed to test the ability of a specific IgY against the ComD receptor molecules to block the biofilm formation by S. mutans and to evaluate whether IgY anti ComD alters the S. mutans protein profiles. One factor that affects the virulence of S. mutans is genetic expression, which is described through the protein profile. The protein profile reflects virulence factors that might be affected by changes in the microenvironment. Based on several studies, the most commonly studied proteins, which are assumed to have the most influence on the virulence of S. mutans, are antigen I/II, glucosyltransferase (Gtf), and glucan-binding protein (Gbp) [15, 16]. The DNA vaccine we used contained pCDNA-ComD, which we had constructed previously . This study was approved by the ethics committee of the Universitas Indonesia Faculty of Dentistry. 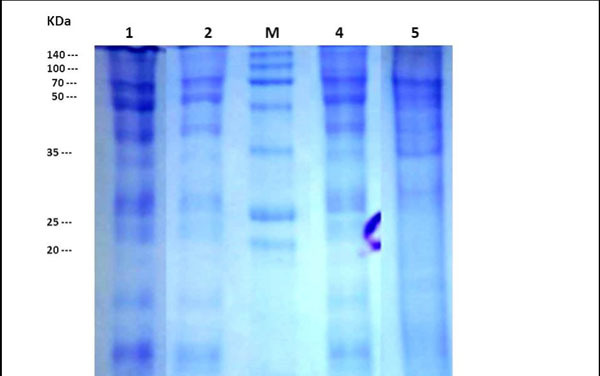 Ten adult hens of large breeds were injected intramuscularly with 50 μg of the DNA vaccine isolated from E. coli (Dh5α). This immunization was carried out once in each of week 1, week 3, and week 6, after which the titer of antibodies in the blood was measured, and the eggs were collected and stored until they were used for IgY purification. The IgY from the egg yolk was purified using the EGGstract purification system (Promega, Madison, Wisconsin USA). Egg yolks were separated with an egg separator for further separation of the fat, which resulted in the water-soluble fraction of IgY. Egg IgY deposition was conducted in accordance with the manufacturer's recommendations. Quantification of IgY specific to S. mutans ComD was determined using the Enzyme-linked immunosorbent assay (ELISA) technique. The concentration of the water-soluble fraction of IgY, which was used in further experiments, was 0.14%. S. mutans cells were collected from subjects with and without dental caries. Bacteria were cultured in Trypticase Soy Broth Agar (TYSBA) for 48 h prior to being used for biofilm assays, immunogenicity testing, and protein band profiling. The effect of IgY anti S. mutans ComD on S. mutans biofilm formation was evaluated. A crystal violet assay was performed to determine the quantity of biofilm formed . Briefly, isolates were grown overnight in TYSB broth at 37°C. Cultures were diluted at 1:20 in fresh LB broth at room temperature, and 200 uL of this suspension was used to inoculate sterile, 96-well polystyrene microtiter plates (Iwaki, Tokyo, Japan). After 24 h at 37°C, the biofilms grown on microtiter plates were washed with PBS, dried in an inverted position, and stained with 1% crystal violet for 15 min. After rinsing with deionized water, the crystal violet was solubilized in 200 uL of ethanol acetone (80:20, vol/vol), and quantitated by adding 95% ethanol followed by measurement of the absorbance at 595 nm. To determine the immunogenic properties of IgY, ELISA was performed by incubating S. mutans cultures with appropriate test groups of IgY and control solutions. S. mutans culture isolated from caries and free caries subject were coated in microplate plate prior incubated with IgY overnight at 40°C. The next day the plate were washed with phosphate buffer saline Tween 20 (PBST) (Sigma, St. Louis, MO USA) followed by incubation with Goat Anti-Chicken IgY H & L (HRP) (abcam, Cambridge, UK) for 1 hour at 37°C. After washed with PBST, 3,3’,5,5’-Tetramethylbenzidine (TMB) (Bio-Rad, Bio-Rad, Platelia, USA) substrate was added and HCl 0.1 N was used to stop the enzymatic reaction. The optical density of each group was determined using a microplate reader at 450 nm . We evaluated the effect of IgY anti ComD on the protein expression of S. mutans. We collected the cells by centrifugation (13.000 rpm, 1 min). Each of the collected pellets was washed once with PBS and homogenized using an ultrasonic homogenizer (Omni-Ruptor 250, OMNI International Inc.) The protein expression of S. mutans was analysed by sodium dodecyl sulphate polyacrylamide gel electrophoresis (SDS-PAGE). 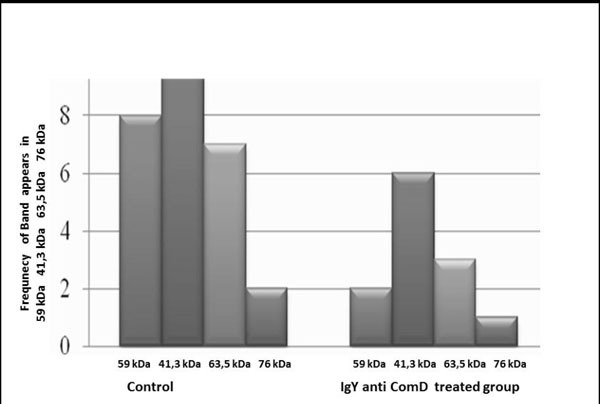 We found that IgY anti ComD showed immunoreactivity properties against both isolates of S. mutans (from subjects with and without dental caries; (Fig. 1). 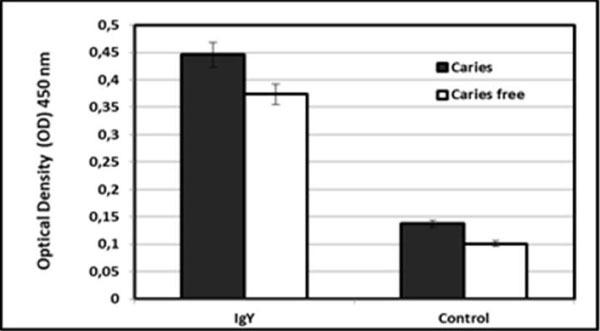 The immunogenicity of the IgY was greater against S. mutans from subjects with caries than for cultures from caries-free subjects, but the difference was not statistically significant (P > 0.05). The capacity of both isolates to form a biofilm was suppressed by the antibody (Fig. 2). 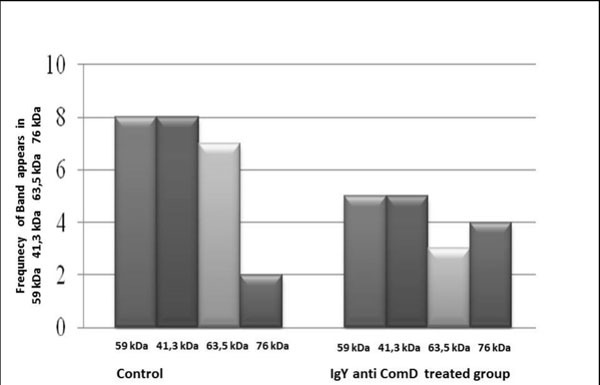 IgY anti S. mutans ComD immunogenicity against S. mutans isolated from caries and caries free subjects. Biofilm formation of S. mutans on caries and caries free subject after exposure IgY anti S. mutans ComD. Effect of IgY anti S. mutans ComD in the protein expression of S. mutans from caries free subjects. The SDS-PAGE analysis showed that the expression of some protein bands (41.3 kDa, 59 kDa, 63.5 kDa, and 76 kDa) was downregulated by the antibody in the isolates from caries-free subjects. Proteins with a molecular weight of 59 kDa were expressed in eight of the isolates from the control group, and only in two from the treated group. In the isolates from subjects with caries, the expression of proteins with a molecular weight of 41.3 kDa, 63.5 kDa, or 76 kDa decreased in the treated group relative to the control group (9, 7, and 2 versus 6, 3, and 1; Fig. 3). The antibody affected protein expression in isolates from subjects with caries, decreasing protein expression to similar levels as in isolates from caries-free subjects, except for a 76 kDa protein. The expression of proteins with molecular weights of 41.3 kDa, 59 kDa, and 63.5 kDa decreased in the treated group relative to the control group (8, 8, and 7 versus 5, 5, and 3; Fig. 4). (Fig. 5) shows a representative protein profile for this study. Effect of IgY anti S. mutans ComD in the protein expression of S. mutans from caries subjects. Profile of protein bands of S. mutans. Lane 1: S. mutans isolated from caries-free subject (control), Lane 2: S. mutans isolated from caries subject after incubation with IgY anti S. mutans ComD, M : Marker, Lane 4: protein band from S. mutans isolated from caries-free subject after incubation with IgY anti S.mutans, Lane 5: S. mutans isolated from Caries subject (control). The ComC mutant, unable to produce or secrete competence-stimulating peptide (CSP), forms biofilms with an altered architecture, whereas the ComD and ComE mutants, which are defective in sensing and responding to CSP, form biofilms with reduced biomass [3, 18, 19]. The results of this study indicate that IgY anti ComD can inhibit biofilm formation by S. mutans cells isolated from subjects with or without caries. This suggests a promising strategy for providing a level of protection from dental caries caused by these organisms. This finding is similar to the effectiveness of active immunization with Glucan Binding Protein B(GBP-B), via systemic  or mucosal  routes, in preventing the adhesion of S. mutans onto tooth surfaces. The present study, however, is the first to demonstrate that an antibody to ComD from S. mutans can be protective when passively administrated. This phenomenon could be because the quorum sensing system in S. mutans also affects acidogenicity, aciduricity, genetic transformation, and bacteriocin production . Furthermore, the protective effect may apply to subjects with all levels of susceptibility or resistance to dental caries. Our study suggests that using the water-soluble fraction of IgY yields good results, which might be a valuable finding to support further research into clinical applications in the form of mouth rinse, toothpaste, or other oral care products. Our results showed that a solution of 0.14% IgY antibody can inhibit the biofilm formation of S. mutans in vitro. They also demonstrated the immunoreactivity of IgY anti S. mutans ComD against S. mutans isolated from subjects with and without dental caries. In addition, application of this antibody resulted in the suppression of proteins that may be glucan-binding [22-24]. The protein profile reflects virulence factors that might be affected by changes in the microenvironment; for example, Decker et al. reported that the gene expression of ComD in a xylitol-supplemented medium was significantly higher than that in a sucrose-supplemented medium . IgY anti-ComD can decrease biofilm formation and affect the bacterial protein expression of S. mutans. This study was supported by the Grant from The Universitas Indonesia 2011 and Competence Grant from Indonesian Ministry of Education 2013. Authors were grateful for the assistance of Dessy and Maysyaroh from Oral Biology Laboratory Faculty of Dentistry University of Indonesia and Okti from Immunology Department of Veterinary Faculty, IPB. Bogor. Senadheera D, Cvitkovitch DG. Quorum sensing and biofilm formation by Streptococcus mutans. Adv Exp Med Biol 2008; 631: 178-88. Zhang K, Ou M, Wang W, Ling J. Effects of quorum sensing on cell viability in Streptococcus mutans biofilm formation. Biochem Biophys Res Commun 2009; 379(4): 933-8. Li YH, Tang N, Aspiras MB, et al. A quorum-sensing signaling system essential for genetic competence in Streptococcus mutans is involved in biofilm formation. J Bacteriol 2002; 184(10): 2699-708. Li YH, Tian X. Quorum sensing and bacterial social interactions in biofilms. Sensors (Basel) 2012; 12(3): 2519-38. Merritt J, Qi F, Goodman SD, Anderson MH, Shi W. Mutation of luxS affects biofilm formation in Streptococcus mutans. Infect Immun 2003; 71(4): 1972-9. Loo CY, Corliss DA, Ganeshkumar N. Streptococcus gordonii biofilm formation: identification of genes that code for biofilm phenotypes. J Bacteriol 2000; 182(5): 1374-82. Yoshida A. Molecular genetic analysis for oral biofilm formation. Nippon Saikingaku Zasshi 2007; 62(2): 263-9. Yoshida A, Ansai T, Takehara T, Kuramitsu HK. LuxS-based signaling affects Streptococcus mutans biofilm formation. Appl Environ Microbiol 2005; 71(5): 2372-80. Akbari O, Panjwani N, Garcia S, Tascon R, Lowrie D, Stockinger B. DNA vaccination: transfection and activation of dendritic cells as key events for immunity. J Exp Med 1999; 189(1): 169-78. André FE. Vaccinology: past achievements, present roadblocks and future promises. Vaccine 2003; 21: 593-5. Bazhan SI, Belavin PA, Seregin SV, et al. Designing and engineering of DNA-vaccine construction encoding multiple CTL-epitopes of major HIV-1 antigens. Vaccine 2004; 22(13-14): 1672-82. Bachtiar EW, Sheng KC, Fifis T, et al. Delivery of a heterologous antigen by a registered Salmonella vaccine (STM1). FEMS Microbiol Lett 2003; 227(2): 211-7. Bachtiar EW. Enhanchment of immune responses to Salmonella-delivered heterologous antigens. Australia: RMIT University 2005. Bachtiar EW, Coloe PJ, Smooker PM. Construction and immunogenicity of Salmonella vaccine vector expressing HIV-1 antigen and MCP3. Acta Microbiol Immunol Hung 2009; 56(4): 403-15. Terao Y, Isoda R, Murakami J, Hamada S, Kawabata S. Molecular and biological characterization of gtf regulation-associated genes in Streptococcus mutans. Oral Microbiol Immunol 2009; 24(3): 211-7. Yang D, Liu T, Cao F. An experimental study on PAc and GTF gene vaccines of Streptococcus mutans against rats caries: antibody levels in saliva and serum. Hua Xi Kou Qiang Yi Xue Za Zhi 2003; 21(5): 396-9. Bachtiar EW, Bachtiar BM. Construction of Caries DNA Vaccine pCDNA-ComD. Int J ClinPrev Dent 2015; 11(3): 137-42. Bachtiar EW, Bachtiar BM, Dewiyani S, Surono Akbar SM. Enterococcus faecalis with capsule polysaccharides type 2 and biofilm-forming capacity in Indonesians requiring endodontic treatment. J Investig Clin Dent 2015; 6(3): 197-205. Kreth J, Hung DC, Merritt J, et al. The response regulator ComE in Streptococcus mutans functions both as a transcription activator of mutacin production and repressor of CSP biosynthesis. Microbiology 2007; 153(Pt 6): 1799-807. Fan MW, Bian Z, Peng ZX, et al. A DNA vaccine encoding a cell-surface protein antigen of Streptococcus mutans protects gnotobiotic rats from caries. J Dent Res 2002; 81(11): 784-7. Jia R, Guo JH, Fan MW, et al. Mucosal immunization against dental caries with plasmid DNA encoding pac gene of Streptococcus mutans in rats. Vaccine 2004; 22(20): 2511-6. Banas JA. Virulence properties of Streptococcus mutans. Front Biosci 2004; 9: 1267-77. Banas JA, Vickerman MM. Glucan-binding proteins of the oral streptococci. Crit Rev Oral Biol Med 2003; 14(2): 89-99. Hazlett KR, Michalek SM, Banas JA. Inactivation of the gbpA gene of Streptococcus mutans increases virulence and promotes in vivo accumulation of recombinations between the glucosyltransferase B and C genes. Infect Immun 1998; 66(5): 2180-5. Decker EM, Klein C, Schwindt D, von Ohle C. Metabolic activity of Streptococcus mutans biofilms and gene expression during exposure to xylitol and sucrose. Int J Oral Sci 2014; 6(4): 195-204.